The Natural History Museum's Broken Hill skull is 'one of the most important relics of human evolution' says human origins expert Chris Stringer. It is on temporary display in the Treasures Cadogan Gallery. Just over 90 years ago a discovery was made that started a fascinating journey exploring human evolution in Africa. The Broken Hill skull was the first early human fossil to be found in Africa and evidence suggests it probably represents the species that we, Homo sapiens, descended from. For the first time ever, the skull goes on public display in the Natural History Museum's Treasures Cadogan Gallery. The skull was found in the Broken Hill mine in Zambia, in 1921. It belongs to the ancient human species Homo heidelbergensis. The skull belonged to an adult, probably male, and has a massive brow bridge and large face. It is the finest known example of its kind. Homo heidelbergensis lived around 600,000 to 250,000 years ago. They were distinctly human in physique and behaviour and evidence suggests these ancient people were accomplished tool makers and could skillfully butcher large animals. Scientists today know much more about the human family tree than they did in the 1920s. Although other early human fossils had been discovered at that time, such as Neanderthals in Europe and Homo erectus in Asia, the African link at the centre of our own evolution hadn't been established yet. Chris Stringer with the Broken Hill skull. 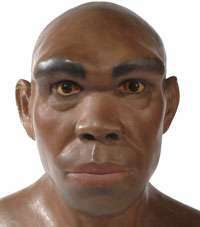 It belongs to species Homo heidelbergensis, which has also been known as Homo rhodesiensis. Charles Darwin had predicted in the 1870s that humans evolved in Africa because that was where our closest living relatives, the African apes, were. And in the 1980s, the Museum's Chris Stringer was one of the researchers who proposed the Out of Africa model that says all humans living today share a recent African ancestor. More recent DNA studies have revealed that Neanderthals and Homo sapiens shared a common ancestor about 400,000 years ago. Homo heidelbergensis is the likely candidate. 'More than 90 years after its discovery, the Broken Hill skull remains one of the most important relics of human evolution,' says Stringer. 'It is still regularly studied, and I have been collaborating for several years with an international team working on dating it more accurately - we hope to publish our results later this year'. 'The Broken Hill skull it important because is the most complete and best preserved skull of Homo heidelbergensis, the species that gave rise to our own,' says Museum curator of vertebrates Rob Kruszynski. 'Now on display for the very first time its provides the public with a unique opportunity to see this important specimen'. The story of human evolution continues to gather pace. 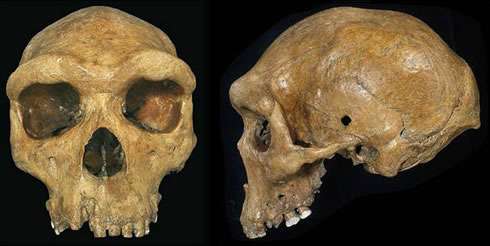 What is certain is that Homo heidelbergensis and its finest fossil specimen, the Broken Hill skull, will play a central role. The Broken Hill skull is on display in the free Treasures Cadogan Gallery from today until the end of May. Did a good sense of smell give us an evolutionary advantage over Neanderthals?